Can a Layer 3 Switch Be Used as a Router? With the development of technology, network switch grows not only in speed like the migration from gigabit Ethernet switch, to 10gb switch, 40gb switch and 100gb switch, but also in complexity to acquire more functions and meet complicated conditions. Layer 3 switch is equipped with advanced functions and is sometimes compared with a router by people. What are layer 3 switch and router? Can a layer 3 switch act as a router? This post will focus on this problem. 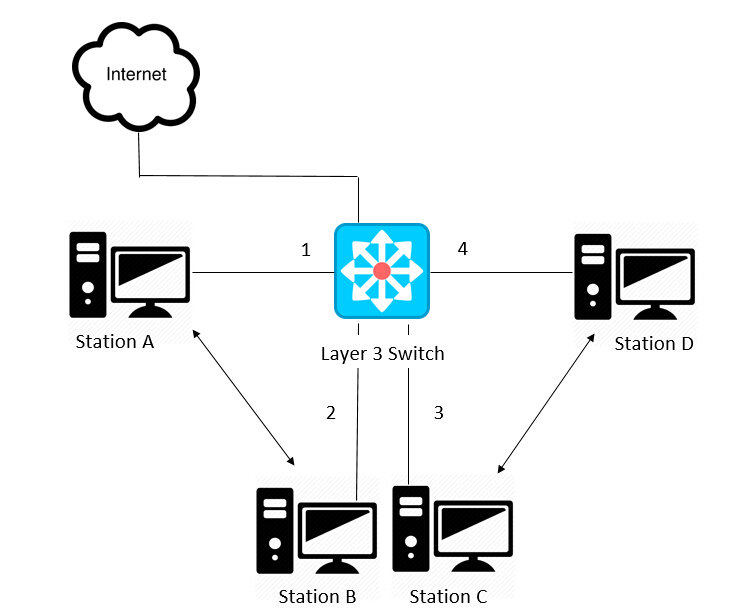 What Is Layer 3 Switch and How It Works? The data switch is a layer 2 switching device that dynamically transmits packets according to the physical addresses (MAC addresses) of connected devices. Layer 3 switch, on the basis of the data switch, boasts additional routing decisions by inspecting the IP addresses. Layer 3 switches are thus able to segregate ports into separate virtual LANs (VLANs) and perform the routing between them. Additionally, this switch helps reduce the amount of broadcast traffic, simplify security management, and improve fault isolation. What Is Router and How It Works? A router works at layer 3 of the OSI Model (Network). It is a device usually located at gateways where networks meet, to connect various local networks and wide networks. It decides where to send packets by utilizing an IP Routing table. When an IP packet comes in, the router looks up the destination IP in the IP Routing table. If that destination IP is not found in the table, the router will drop the packet. The router can perform NAT to translate the private IP address to public address, which can get you into the Internet. So it is a common network device in household use. As a layer 3 switch possesses the routing function of a router, can we replace a router with it? Let’ s have a detailed view of their similarities and disparities. Both layer 3 switch and router work at layer 3 of the network. Layer 3 switches technically have a lot in common with traditional routers. Both of them can support the same routing protocols, inspect incoming packets and make dynamic routing decisions based on the source and destination addresses inside. The switches can also be configured to support routing protocols such as RIP, OSPF, and EIGRP. Internally, the hardware inside a layer 3 switch blends that of traditional switches and routers. As for packet forwarding, router transmits packet by a microprocessor-based software routing engine, while the switch performs switching through hardware. After routing the first data flow, the layer 3 switch will generate a mapping table of MAC addresses and IP addresses, so that the same data flow will directly pass through the layer 2 according to this table, thus eliminating network delay and improving the efficiency of packet forwarding. Externally, layer 3 switches do not offer the WAN-type ports as standard routers do, so they lack WAN functionality. Router requires configurations before deployment due to the inbuilt operating system. On the contrary, the layer 3 switch is usually ready to go when acquired, and configurations are optional as you like. From a software perspective, layer 3 switches are not capable of the extra services that routers typically provide, such as NAT and NetFlow. All in all, it is not recommended to replace a router with layer 3 switch, but you can apply them in the same network at the same time. In addition, whether a layer 3 switch can supplant a router relies upon the switch model and what you expect from it. Some layer 3 switches are almost router substitutions, with a full scope of WAN, firewall, VoIP, and so on. However, those switches are costly, and most layer 3 switches just have Ethernet ports. In this way, a dedicated router is cost-effective than a layer 3 switch. This entry was posted in network switch and tagged layer 3 switch, Layer 3 Switch VS. Router, what is layer 3 switch by Sophie.Yang. Bookmark the permalink.